So you’re probably going to think I’m crazy, but I got this idea in my head for my kitchen table makeover and I couldn’t let it go. Often I’ll see the finished project so clearly in my mind, but sometimes it can take quite a while for me to figure out how to get to there. That was definitely the case with this project. Here’s the before… before the kitchen chairs makeover. 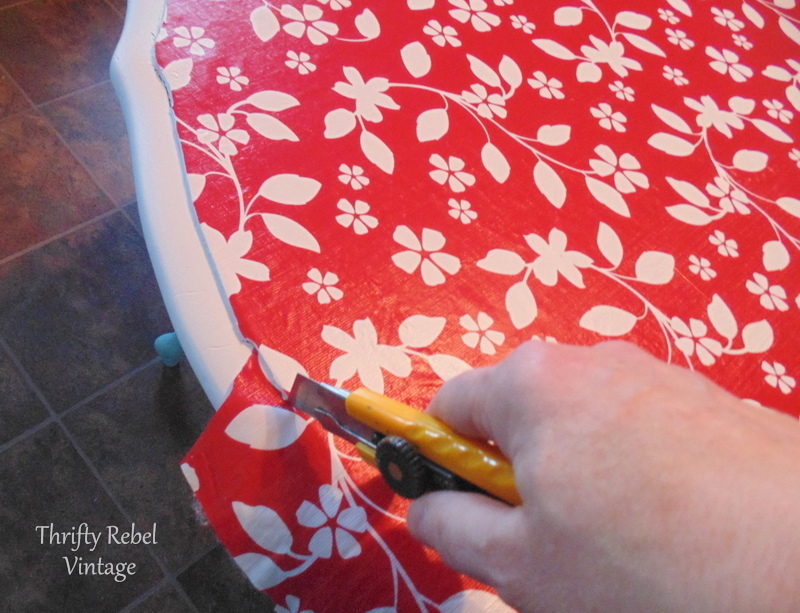 The table has seen better days so I decided I wanted to cover it with something permanent, and the best way to do that is with decoupage. But first I wanted to paint the table so I gave it a light sanding. 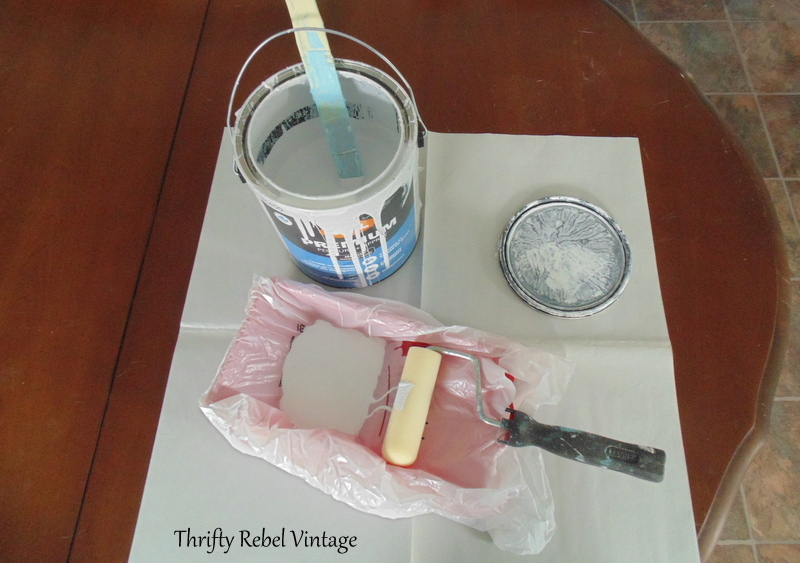 For the top I’m using the same ReStore white paint that I used on the kitchen walls and on the faux tile backsplash. 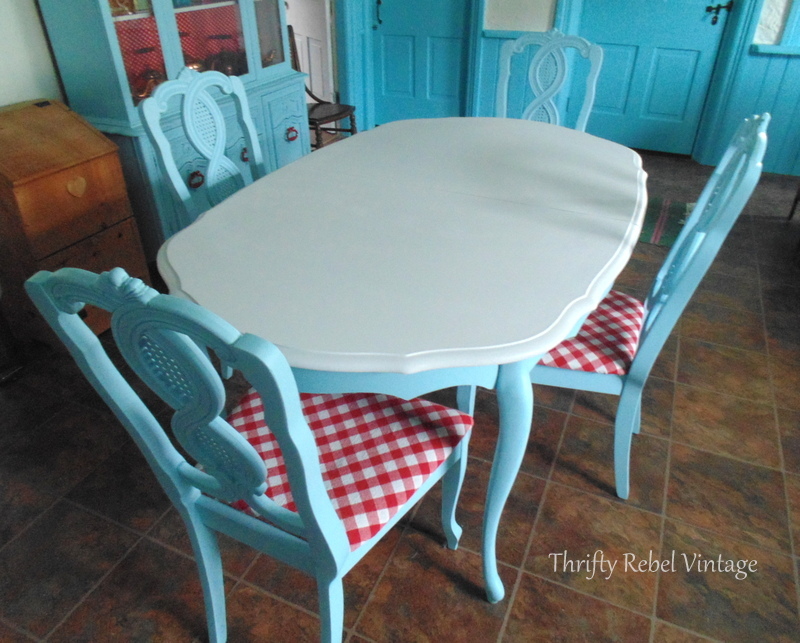 And I panted the legs and skirt the same blue as the chairs and the china cabinet. Then it sat for a few weeks while I tried to figure out the best way to get the look that I wanted. I felt that the kitchen, with its polka dots and checks patterns, really needed something floral. I could see it in my mind, and then I saw it in the dollar store… on this $2 flannel-backed vinyl tablecloth. With four cats in the house it’s pretty impossible to keep a fabric tablecloth on the table for any given length of time without it getting damaged or ending up on the floor. So I use these tablecloths all the time, but even they’ll be damaged by those razored cat paws eventually. 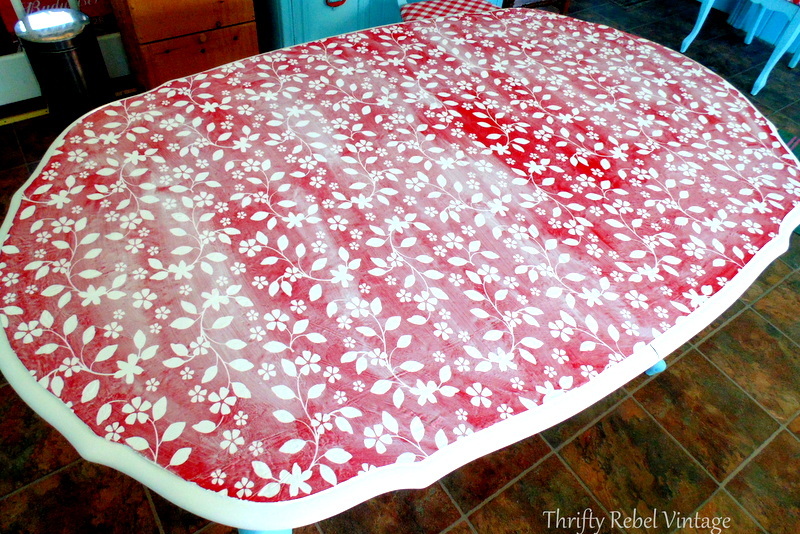 But I’ve never liked all the extra hanging over the sides… so I got this idea for a permanent cat-proof tablecloth. When it first came to me I thought… no you can’t do that. It won’t work. I cut it down closer to the size of the table. Here it is all ready to go. 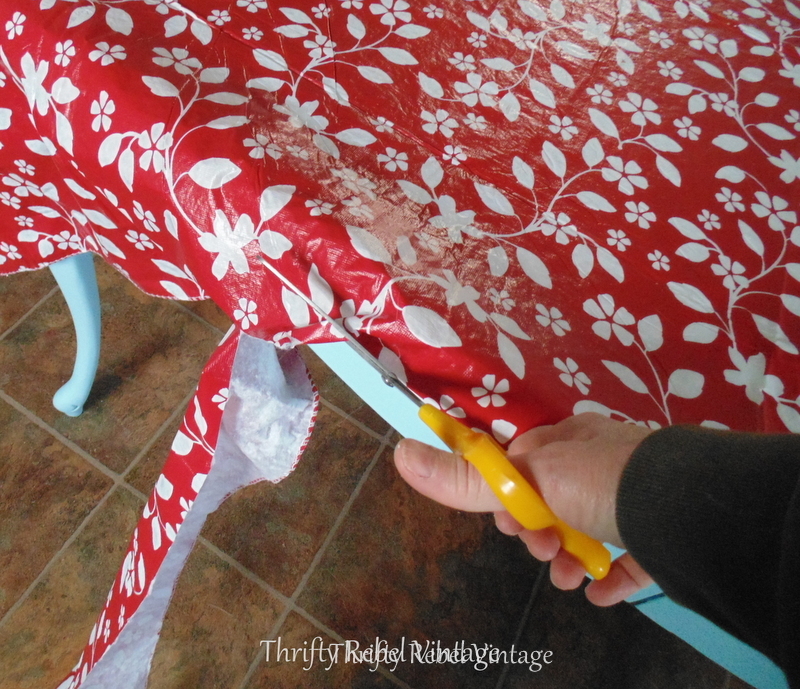 Did you know that you can de-flannel a vinyl tablecloth? I had no idea until I tried. The flannel made the tablecloth a little spongy so I removed as much as I could. I was concerned that the flannel would affect how the mod podge adhered to the vinyl. This took about a half hour, so not too bad really. About a grocery bag full. I’ll save it for stuffing a pillow or something. I made sure the vinyl felt nice and smooth to me before moving on. If I felt any little lumps or bumps I removed them. 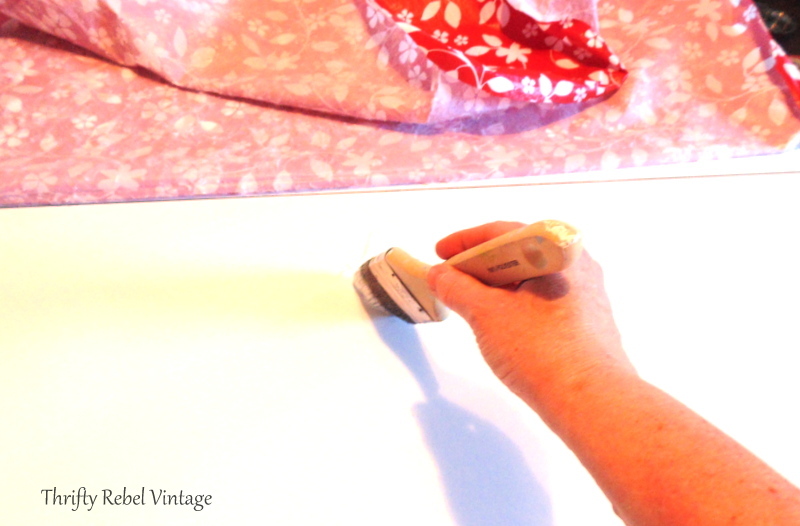 Then I grabbed my mod podge, a brush, and a brayer. 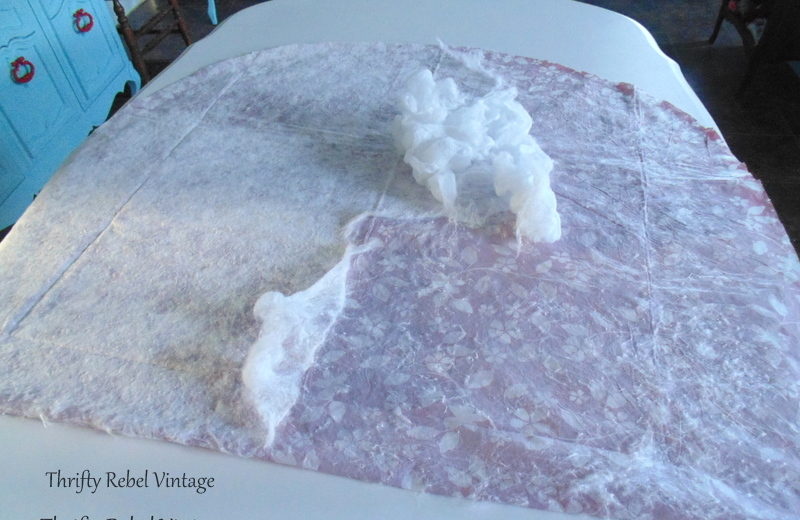 I spread the mod podge over half of the table and folded the tablecloth over that. I had to move really fast because MP can dry very quickly. I smoothed it out as much as I could with my hands…. I did the same to the other half of the table. 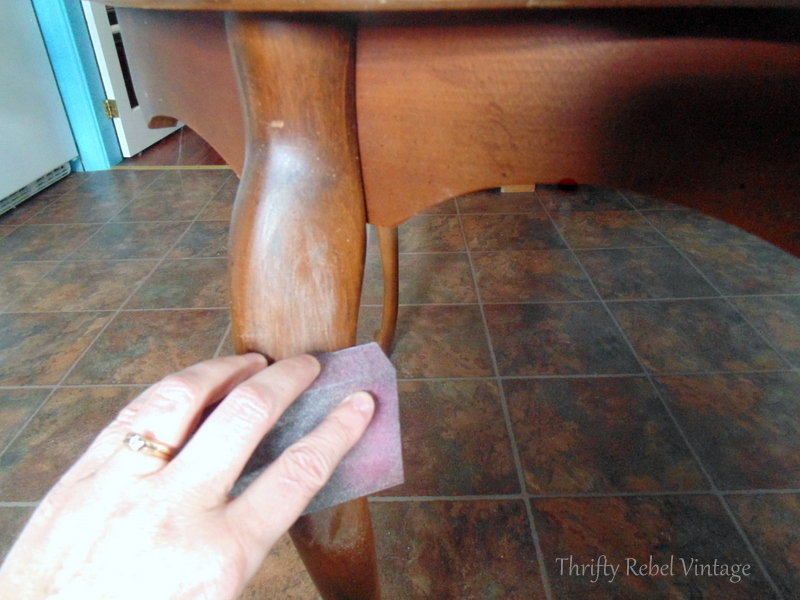 When the undercoat of MP was dry I trimmed the tablecloth to the decorative lip of the table. Then I applied three layers of MP to the top and let it dry for about 2 hours between coats. Here what the set looked like before. It went nicely with my old kitchen, but really needed a makeover to go with the new colour scheme. And here’s the finished table and chairs set. 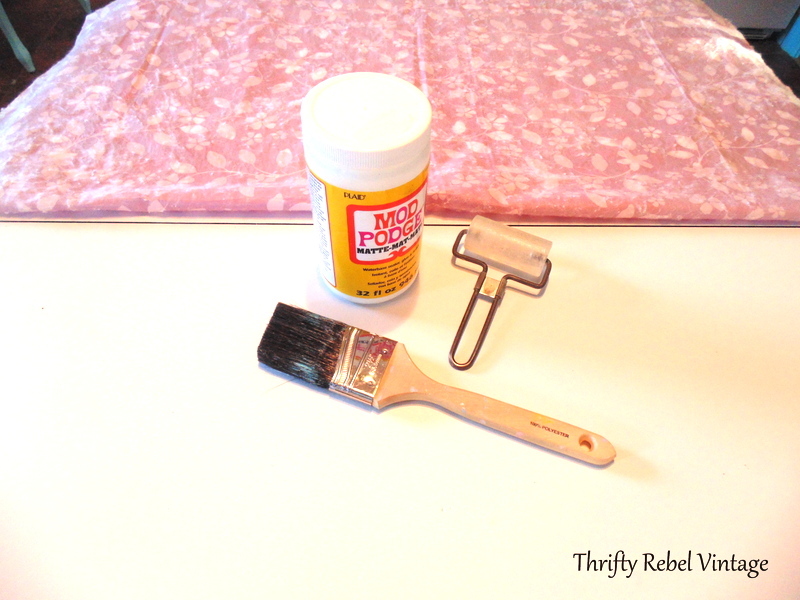 After letting the mod podge cure for a week I added two coats of the same Stays Clear polyurethane that I used on my decoupaged recipe countertops. 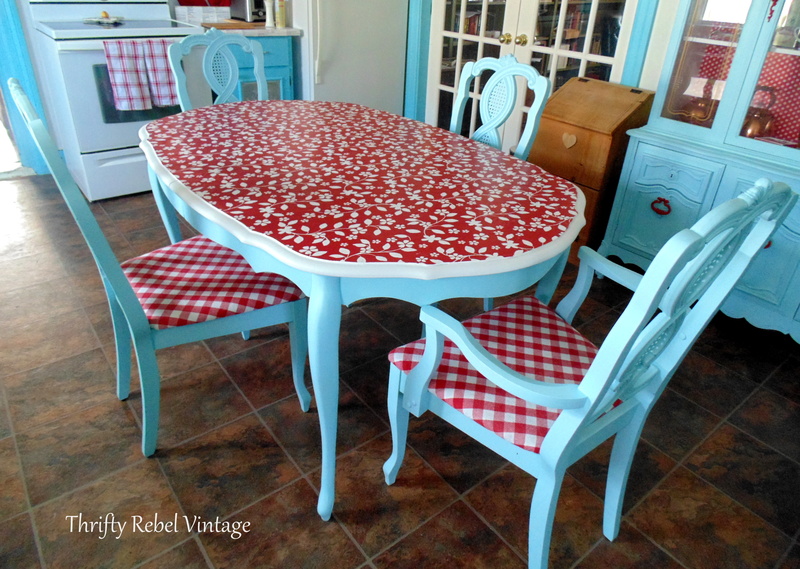 This project was kind of an experiment because I’ve never decoupaged with vinyl before. 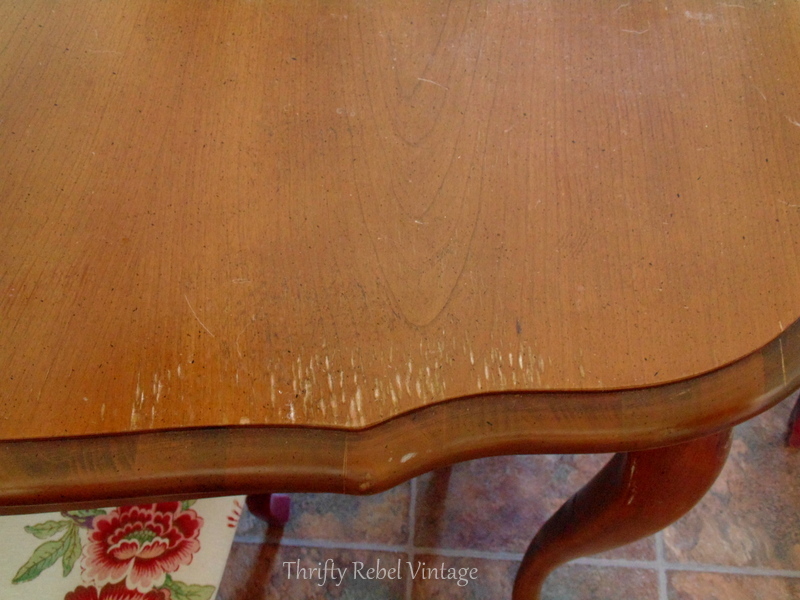 Would I do this on an antique table or one that’s in beautiful condition? Probably not. But this beat up old table was the perfect candidate to give this a try. There is some wrinkling here and there that came with the vinyl tablecloth. That might bother a perfectionist, but I don’t mind in the least. For me that just adds some personality and character. You don’t really notice them until you look real close. 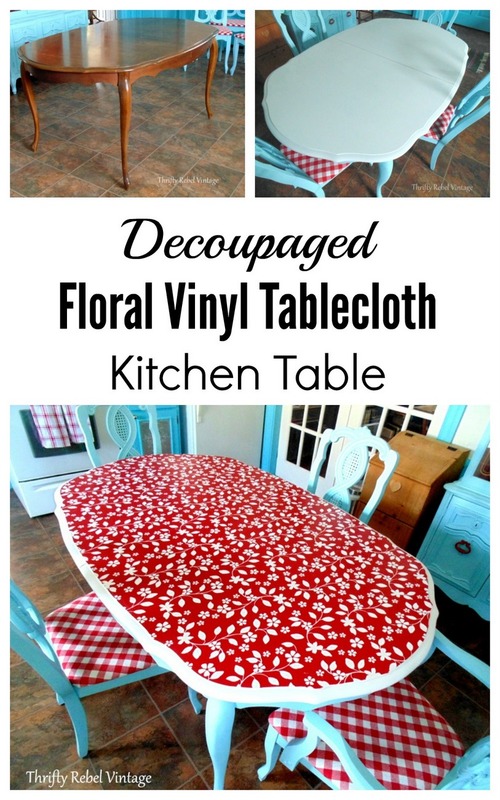 I’m a jump in the deep end kinda gal, but if you’re unsure you could easily test decoupage a small piece of a vinyl tablecloth on a spare piece of wood to see if you like the look. It seems to have adhered beautifully and it feels nice and hard on the table. I usually use pot holders or place mats so that shouldn’t be a problem. And, of course, food should not be placed directly on it. Food safe dishes should always be used. The beauty of this is I have an everyday look that makes me smile, but I can easily change it temporarily anytime I like by using a real tablecloth on top. And most importantly, my permanent cat-proof tablecloth is staying put. My four feline friends will have to find some other mischief to get into. lol. The tablecloth really shows off the curves of the table, which I never really noticed before, and the chairs aren’t hidden with the tablecloth overhang. I absolutely love my table now, and I’m so glad I tried this even though I had no idea how it would turn out. Sometimes you just have to go for it! 🙂 If you don’t you’ll never know. 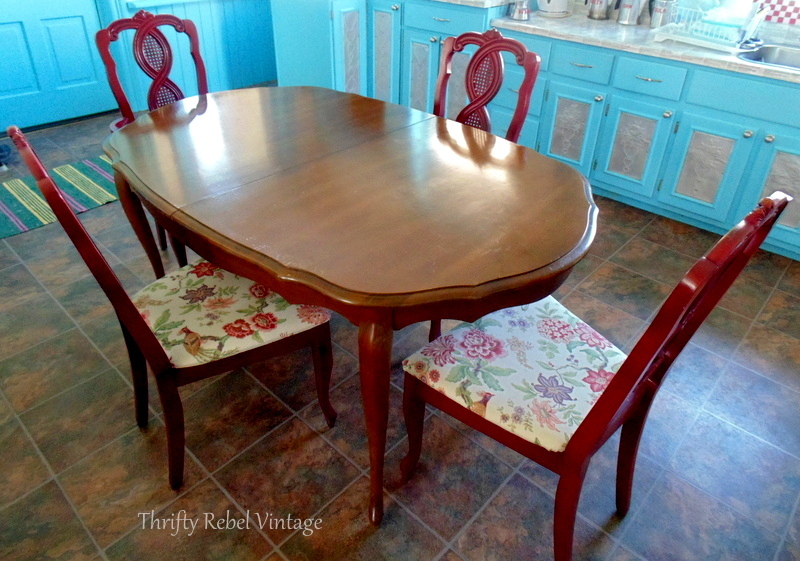 If you enjoyed this kitchen table makeover please share with your friends, and if you’re not already a subscriber you can easily sign up using the sign up form at the top of my side bar. You can find all my kitchen makeover projects here. 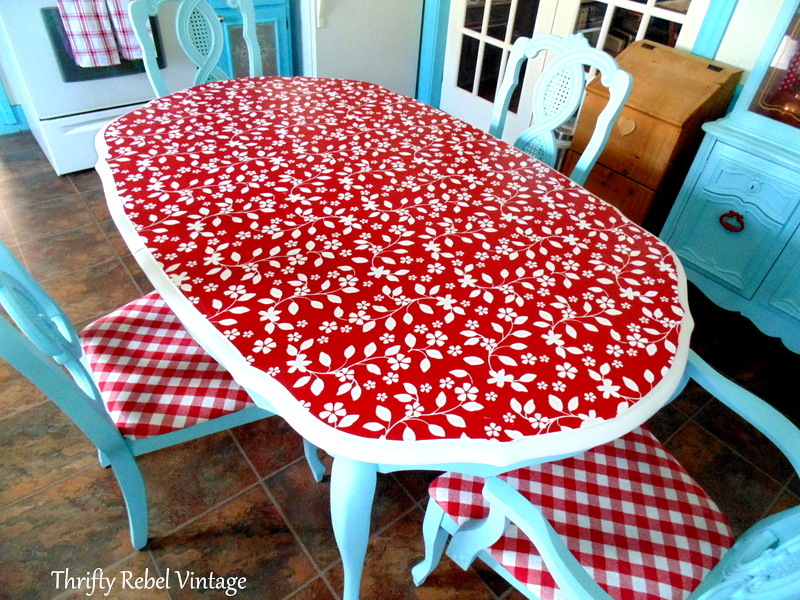 You should love your table make-over as it is Absolutely Awesome. Thanks very much Colleen! I’m very happy with how it turned out. Awesome. This gives me a ton of ideas! Thank you! Thanks Beverly! I’m so glad that my project has inspired you. Wow! I can’t wait to see what you come up with next!! Thanks so much Jessie! Creatives leaps of faith are sooo fun. I’m not always sure what the outcome will be, but it’s fun taking the leap to find out. Your table looks beautiful, Tuula! 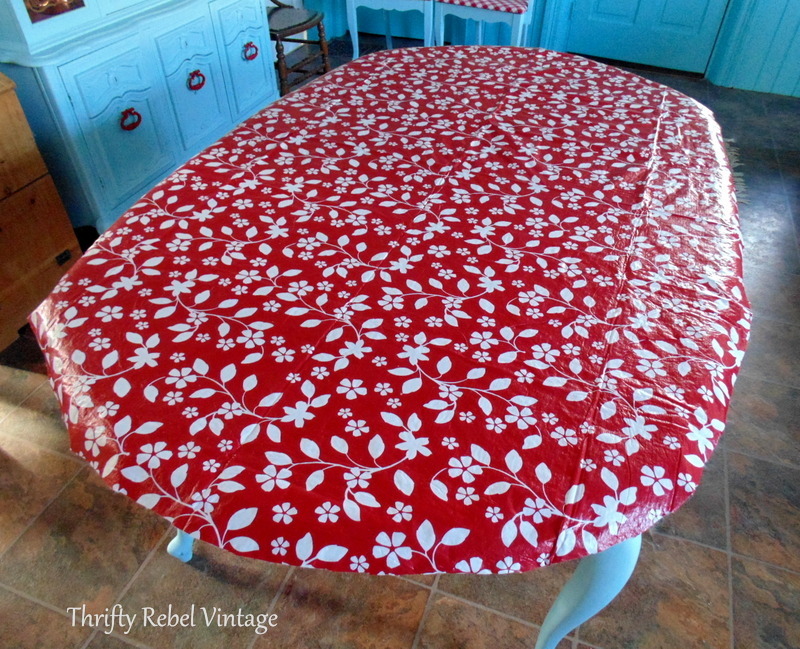 Mod podging a vinyl tablecloth on top is a genius idea! Who would have thought to do something like this? Oh, YOU would! You go, girl! What an awesome transformation! Thanks Gail! I’m really having to stretch myself creatively with this kitchen makeover because I have no budget to stretch. lol. Thank you so much Dona! It’s crazy…right? I’m trying to get this kitchen makeover done with as little money as possible. I’m succeeding budget wise, and I hope I’m succeeding decor wise. 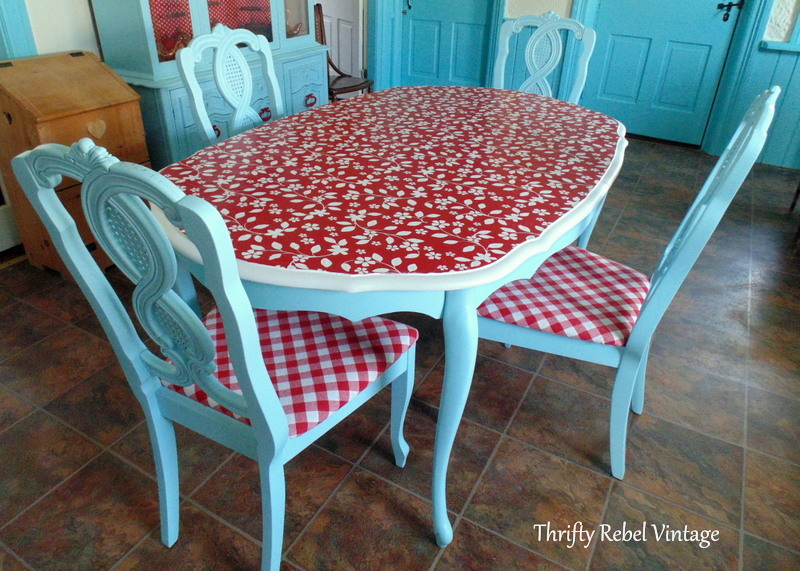 What a wonderful idea – I love the pop of color the red gives the table. Thanks very much Kim! The red floral really adds some fun to the room. 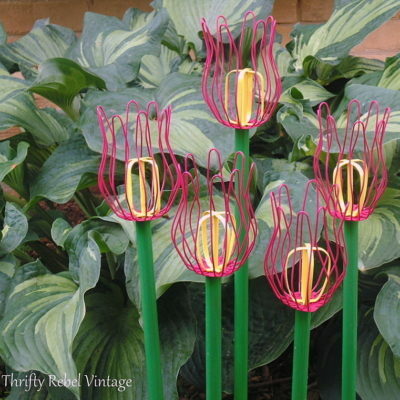 Very pretty and so cheery! I would never have thought of doing this! Love how it looks in your kitchen now! You’re so clever Tuula! Thanks Florence! Finding that tablecloth at the dollar store was kismet. Sometimes I just luck out. Awesome makeover!! I really like how the white border shows off those luscious curves. I dream, you DO. You are amazing. And clever, and inspiring. Thanks for sharing your creativity. I love the floral with the checks on the chair! 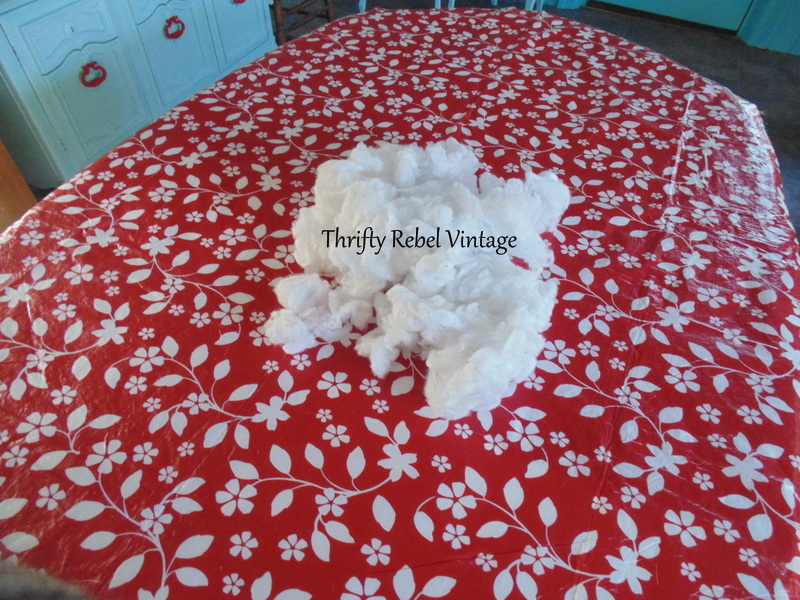 And if you want to cover with a tablecloth for special occasions, that option is still there! Having 6 cats myself, I know what they can do with loose tablecloths …I have edge clips all around to help keep it on straight and they still manage to mess it up. I like the nice clean look of your new table and am seriously considering a new look for my table! I like the way you think Tuula! Thanks Linda! I know you can relate to the cat issue. 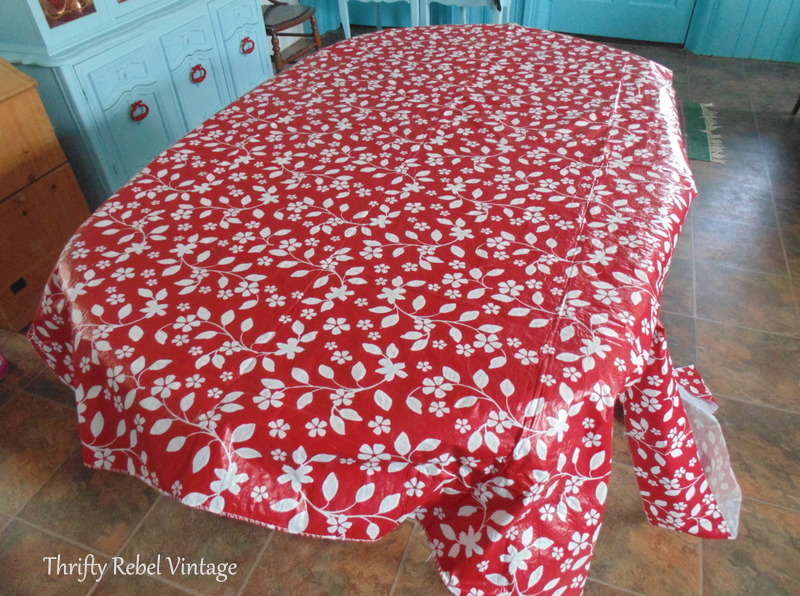 We do love them, but I’ve had one too many tablecloths ruined over the years. It takes only one claw to pull some threads. 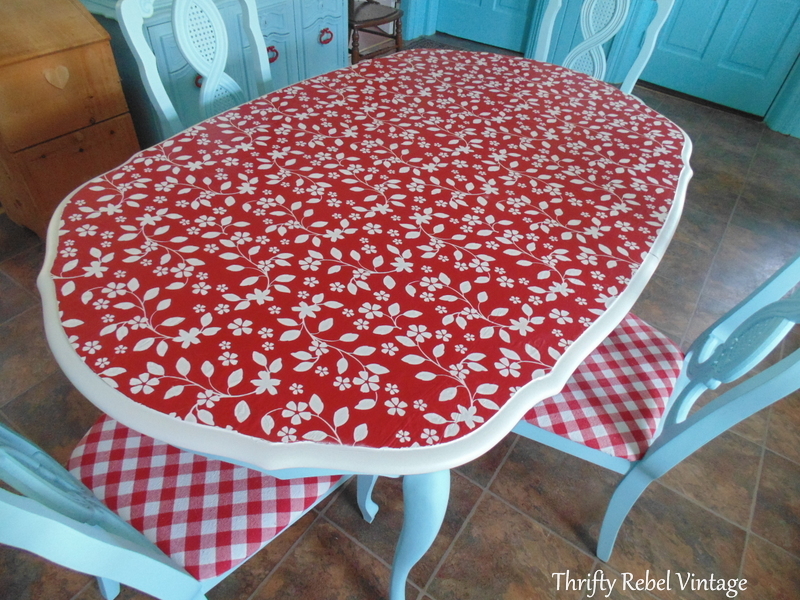 So if you can’t beat them… decoupage a tablecloth on your table. lol. I love it too. Very nice! Who would have thought you could use a vinyl table cloth. Great job. Thanks very much! It never occurred to me either until I saw it at the dollar store. A lot of good things happen at the dollar store. lol. applied on shelves or smaller side table tops. Thanks Mary! You’re so right. It’s kinda like contact paper without the adhesive. It just opens up the pattern possibilities. How pretty this is. And I understand about the cats and tablecloth being a cat mother myself. This will make life easier for you to keep is clean also. Thanks so much Debra! Another cat mother. How wonderful! They do bring so much joy to our lives, even when they’re being mischievous. :). Oh my gosh! This is so cute! I never would have thought of trying that. Great idea…:) Enjoy your new kitchen and table. You are just about the bravest decorator I know! WOW — that’s stunning! I DO know what you mean about having an idea (most of mine come to me at about 3 in the morning! ), picturing it and then trying to figure out how to make it a reality. Sometimes it works, others, not so much. Yours definitely WORKED! Great job! Thank you so much Lauren! I can so relate to the 3am idea thing. A while back I decided to start writing those ideas down because I can’t tell you how many times I’ve forgotten when I woke up in the morning. lol. Shut UP!!! Wow, that looks awesome Tuula!! You are just so creative! Thanks very much Tania! I swear I never would have thought of it if I didn’t find that tablecloth at the dollar store. It’s funny how one things leads to another when it comes to decor ideas. It’s really what keeps decorating fun for me. All kinds of cool in this post! You are a brave brave woman, Tuula – but we knew that! I really love the effect and there are so many practical reasons to do it…thanks for taking the deep end plunge! I could never have imagined this in my wildest (décor) dreams, but you pulled it off! It looks amazing! Thanks AnnMarie! I’m pretty sure if I hadn’t found that tablecloth this idea wouldn’t have come to me. How ideas happens is such a mystery to me still, but that’s what keeps me going. Looks fabulous! I really like those colors together. The entire kitchen redo is amazing. Great job. 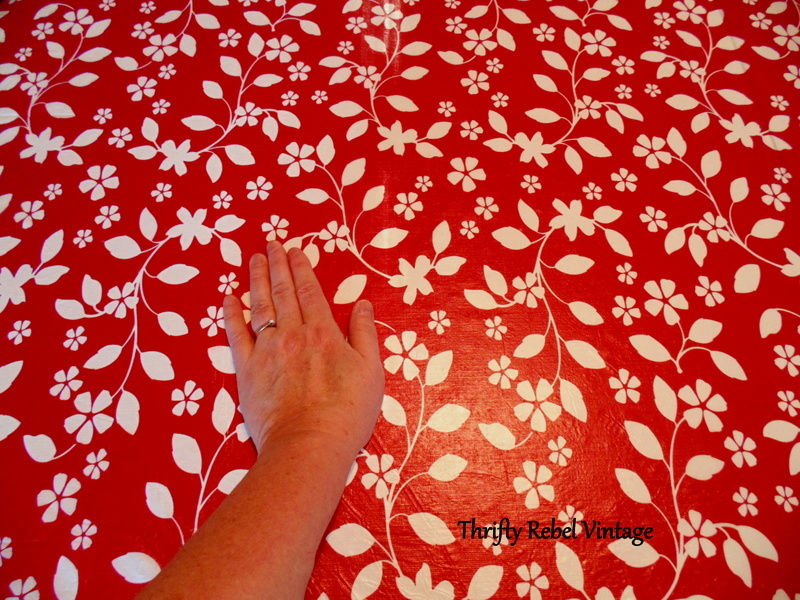 I have wallpapered a table top, but never imagined Mod Podging a vinyl tablecloth to the top. Sharing and pinning! Thanks for sharing Donna! 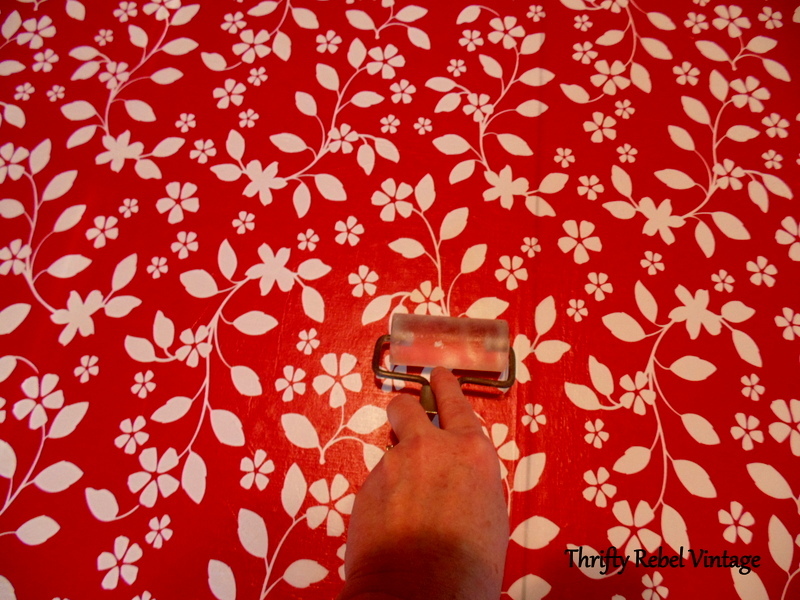 Now that I’ve never done… wallpapered a table top. Sounds like something to try in the future if I ever thrift a cool pattern that I love. I think it looks beautiful too. Quite the idea there! I think if I were to ever want to change it out, I’d get a stencil and paint, paint the background color, and then add the stenciling on top, same kind of effect without needing the Mod Podge, and perhaps there is a finish that could be use on top of the paint to make it last longer as well as being food safe??? Just some additional thoughts, though I like the effect you have there. Blessings! 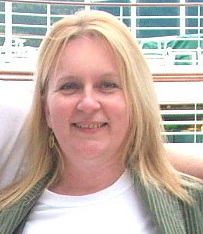 Thanks LynneDe! I appreciate the suggestion. 🙂 I’ve painted and stencilled furniture in the past and I don’t know of any completely food safe furniture finish. I agree that stencilling a table top is always an option, but I think this will be more durable in the long run. We’ll see. Only time will tell. 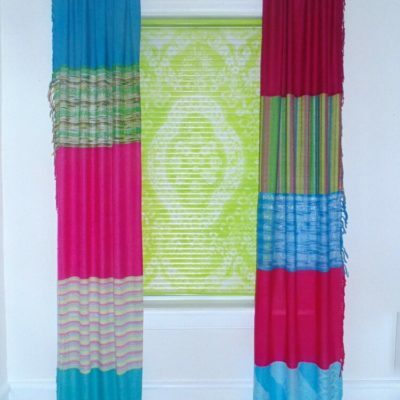 When I feel like I need a temporary change I’ll reach into my tablecloth collection.